On March 1, a group of Uighurs from Xinjiang attacked the Kunming train station in southwest China using foot-long knives, killing 29 and injuring 143. The terror attack, popularly referred to as “China’s 9/11,” is a spillover from Xinjiang’s internal conflict. 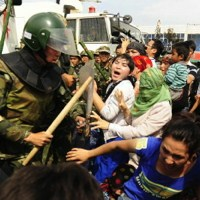 Since being “liberated” by Chinese Communists in 1949, the region has experienced sporadic episodes of significant violence between Uighurs, the dominant ethnic group in the region, and Han Chinese. The source of conflict is disputed—the Chinese narrative emphasizes external, separatist and jihadist influences, whereas Western analysts tend to focus on Uighur grievances toward discriminatory government policies.